President Donald Trump at the White House, Oct. 23, 2017. U.S. President Donald Trump will use his upcoming trip to Asia to further consolidate international pressure on North Korea to attempt to deter its pursuit of perfecting a nuclear-tipped intercontinental ballistic missile. “If we fail to confront and reverse the threat from North Korea we’re going to be living in a much darker era,” according to a senior White House official who, on Monday, defended the administration’s more assertive stance towards Pyongyang. “The president’s rhetoric, and more importantly his actions, have led to the most substantial shift and progress by the international community in confronting this threat than we’ve seen over the past several administrations,” the official told White House reporters. There is much speculation whether Trump, following in the footsteps of some of his predecessors will go to the Korean Demilitarized Zone, and peer into the North, placing him within meters of soldiers on the other side of the most militarized border in the world. Whether Trump will go there is undecided, according to White House officials. FILE - U.S. and South Korean soldiers salute during a change of command and change of responsibility ceremony for Deputy Commander of the South Korea-U.S. Combined Force Command at Yongsan Garrison, a U.S. military base, in Seoul, South Korea. Instead, Trump – at the invitation of the South Koreans – is likely to go to Camp Humphries, 65 kilometers south of Seoul, which is the fastest growing U.S. army installation on the peninsula. The president, during his time in Beijing during his November trip, will also raise the North Korean issue with Chinese President Xi Jinping. Amid recent strengthening of United Nations’ sanctions against North Korea, the senior administration official – nothing that Beijing accounts for 90 percent of international trade with Pyongyang – said "If China is not fully implementing those resolutions it undermines the international will." White House officials, while praising China for applying what they term as “unprecedented” pressure on North Korea, contend that Beijing can still do more. Former U.S. President Jimmy Carter has offered to return to Pyongyang on behalf of the Trump administration – something he did over the objections of President Bill Clinton in the mid-1990’s. FILE - USS Arizona Memorial, part of the World War II Valor in the Pacific National Monument, in Joint Base Pearl Harbor-Hickam, Hawaii, adjacent to Honolulu, Hawaii. Trump is to make his first visit to the Asia-Pacific region from November 3. Lasting 12 days it will be the longest trip, so far, of his presidency. 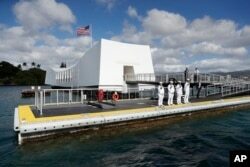 His first stop will be Hawaii where he will be briefed at the U.S. Pacific Command and visit the memorial at Pearl Harbor, built over the sunken USS Missouri, the final resting place for many of the more than 1,100 crewmen killed on December 7, 1941 when Japanese naval forces attacked the base. From there, Trump flies to Japan where he will speak to American and Japanese service members and hold talks with Prime Minister Shinzo Abe on security and trade issues. Japanese officials say the two leaders will also make time to play golf together but the White House has yet to confirm that. In South Korea, it is confirmed that Trump will address the National Assembly and hold talks about the North Korea threat with President Moon Jae-in. FILE - Vietnamese President Tran Dai Quang, left, and his Chinese counterpart Xi Jinping attend a signing ceremony at the Great Hall of the People in Beijing. In China, the U.S. president will also raise trade differences. At regional meetings in Vietnam and the Philippines Trump may also hold talks on the sidelines with various heads of government, including Russian President Vladimir Putin, but there is nothing to announce at this time, according to officials. 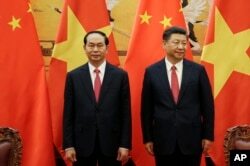 During the Vietnam visit the president is also set to travel from the APEC summit in Da Nang to the capital of Hanoi for talks with President Tran Dai Quang. The White House confirmed Monday that Trump will hold official talks in the Philippines with President Rodrigo Duterte, host of the ASEAN meetings, who has been denounced internationally for his war on drugs which had led to possibly thousands of extrajudicial killings. President Trump “will always speak frankly about our views on human rights,” replied the senior White House official when asked about the deadly crackdown.